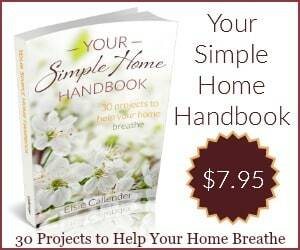 This post is part of the Monday series on simplifying that inspired my book, Your Simple Home Handbook. The series began with 10 Reasons to Start Simplifying Now. Yesterday I told you why I think it’s a great idea to simplify your makeup drawer. Once you trim down your makeup stash, your routine will be simpler, too. It’s amazing how much time you’ll save in the morning! Since I’m trying to avoid harmful ingredients in my skincare products, most makeup is “off-limits” for me anyway. That makes my life simpler. I’ve found a few products that I’m happy with, and I stick with those. I decided to simplify my makeup routine by forgoing eye liner, lip liner, concealer, bronzer, and primer. I’m also not a big colour person for most makeup. Once I found good shades of foundation and blush, I stopped looking. Eye shadow has never been my thing. I do, however, keep a mini rainbow of Burt’s Bees lip tints to match with what I’m wearing. So here’s my makeup routine, which takes just 5 minutes flat. What do I love about this routine? Just a few products means it’s really cheap! Do you want lots more simple living ideas? Check out my brand new book! 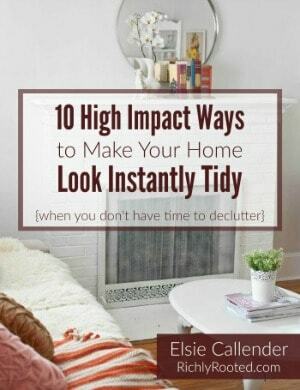 Your Simple Home Handbook is a 100+ page guide to decluttering your home and simplifying your stuff. Work through 30 different areas of your home–at your own pace–and enjoy the benefits of a space that breathes! 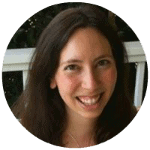 Click here to learn about my book! I’m going to have to try Everyday Minerals. I’ve been using a tinted moisturizer, but I’m down to end. Simple is always better in my book!! I find a simple make up routine is easiest for me also. I am 65 years old and am very fortunate not to have to wear foundation. I am blessed with very good skin at my age. I guess taking care of the face in younger years is worth all the trouble. I wear a touch of concealer around a few red spots, a bit of neutral eye shadow, blush, mascara and a light application of lipstick matching my blush and I’m ready for the day. Simple and easy! We must have similar books(: One reason I like EM is that they are MUCH less expensive than some of the mineral makeups on the market! I love EM! It is such a good price compared to many mineral makeups, too! I love the EM products! I bought a couple of their sample packs a while back and they have lasted forever! I know! I’ve only ordered from them once because they last so long! I got the full sizes, so it’ll be a while! 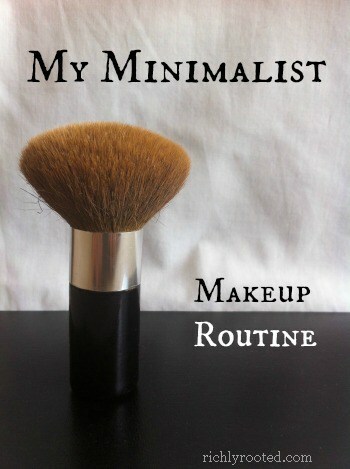 I am moving toward a minimalist lifestyle and would like to minimize my own make up routine. I am 43 and under a great deal of stress right now and I feel that make up is necessary for me, but I still want to pare down. Could I use your 5 step routine for myself? Foundation (I haven’t tried a mineral foundation…yet), blush, mascara, lip color sounds SO good to me! I’d be skipping powder, eyeliner, and eye shadow! Do you have a link for your foundation? I’m looking for an inexpensive powder foundation that covers well.